During my recent look over at the Ridgid website I noticed something interesting. Ridgid is now re-branding a few of the more common MagSwitch products. This is likely to mean you have a pretty good chance of getting these at your local HomeDepot, or having them ordered from HD if they can not be found in your area. This is a smart move for MagSwitch if HomeDepot makes them available in most of there stores. This could also do a lot to get the MagSwitch name out there. If things don't take off, you better get your Ridgid MagSwitch while you can, because the one listed on the HD website is about $10 cheaper ($40) then the regular MagSwitch Featherboard ($50). 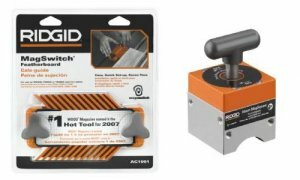 As of now Ridgid is offering these MagSwitch products. Let me know if you spot any at your local HD.